The Parish of Caverswall lies within the northern region of the county of Staffordshire. The hills of the Pennine Chain extend into the region creating a landscape of low but steep hills. In physical terms the shape of the parish is long and narrow. The length in a north – south direction is 4.8 miles, the width is 1.5 miles at the widest point. The land rises to a height of 281 metres (922 feet) above sea level on the north eastern boundary of the parish. This area of the parish is also the source of the River Blythe which flows through the parish before leaving at the southern corner. Beneath the soil the carboniferous rocks contain coal and ironstone strata. There are also extensive measures of sand and gravel. The boundaries of the parish have changed over time, the present day parish being somewhat smaller than it was in the past. The village of Caverswall is an ancient settlement which later gave it`s name to one of the 183 original parishes in Staffordshire. However, the story may well begin long before the foundation of either the parish or the county itself. 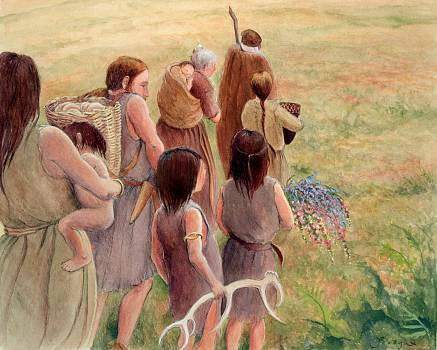 Evidence of human settlement during the Neolithic period and also the Bronze age has been found in a number of places in the county. A British tribe of people, known as the Cornovii, are known to have occupied the region but the actual tribal boundaries are not certain. There are nine Iron Age (800 BC – AD 43) Hill Forts in the county, the nearest of these to Caverswall are Bunbury Hill near Alton, Bury Bank near Darlaston and Castle Ring on Cannock Chase. The period of history known as Roman Britain commenced with their invasion in the south of the country in A.D. 43. By A.D. 48 the Roman Armies had reached the midlands region and established a base at Wall (Letocetum) near Lichfield. The Romans constructed a number of roads across the region. One of these roads entered the area in the east at Rocestor and led to the settlement at Chesterton. The road passed through the present day villages of Tean, Draycott in-the Moors and Blythe Bridge. The route continued through Meir and Longton towards Stoke. In his book, `The Borough of Stoke Upon Trent,` John Ward describes the route of the road. He also explains that the Foundation Charter of the Abbey of Hulton, dated 1223, mentions `Rykeneld Street` passing through `the village of Mere`. There was another Roman road which connected Rykeneld Street with the the settlement at Buxton. (Aquae Arnermetiae) The exact route of the southern section of this road is not certain but a possible joining point may have been at Meir or at Blythe Bridge. If this is correct then the site of the present day village of Caverswall was bounded on two sides by Roman roads. The approximate distance from the site to the nearest road was 1 mile. The Romans finally abandoned Britain in A.D. 450 after a period of rule lasting almost 400 years. The Anglo-Saxons are thought to have settled in the region during the second half of the sixth century. Evidence of settlement has been located at various places including Burton upon Trent, Lichfield and at Barlaston. The region was a part of the kingdom of Mercia and it became the most powerful of the Anglo Saxon kingdoms. The first Anglo Saxons were pagans, the conversion of the English to Christianity is thought to have commenced in A.D. 653. The Anglo-Saxon Chronicle records that in A.D. 787 the ships of the Danishmen started to arrive on our shores. The Danes mounted a series of raids and eventually conquered Mercia. 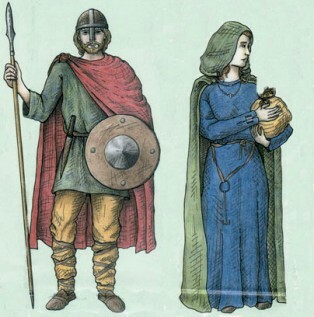 In 878 England was divided by the Treaty of Wedmore agreed by King Alfred and the Viking leader Guthram. The eastern side of England became known as the Danelaw. The exact boundaries of the Danelaw are not known, some historians take the view that parts of what is now North Staffordshire were under Danish control. According to the book `A History of Staffordshire` by M.W. Greenslade and D.G. Stuart, it was during the reign of Edward the Elder (899 – 925) that Staffordshire became `established as an administrative unit`. The County was established on the `burh` of Stafford and sub-divided into five separate areas known as hundreds. The hundreds took their names from prominent topographical features. Caverswall is located within the hundred of Totmonslow. The Moot Court of the Hundred met at Totmonslow to levy taxation and deal with civil and criminal matters. The Oxford Dictionary of English Place Names written by A.D. Mills includes a listing for Caverswall. Mr Mills suggests that the original name consisted of two separate elements, a personal name added to the name of a place i.e. a `spring or stream of a man called Cafhere` hence : Cafhere`s Well. The name is thought to have originated during the `Old English Period` c.450 – c.1086. The Domesday Book of 1086 lists 45 place-names within the Hundred of Totmonslow in `Statfordcire`, including `Cavreswelle`and `Westone`. The Norman survey contains the results of a statistical survey of the population, the productive resources, their value and who held them. Robert De Stafford himself holds, in Cavreswelle (Caverswall) 1 virgate of land. Arnulf holds from him. Wulfgeat held it; he was a free man. Land for 4 ploughs. In lordship 1; 10 villagers and 2 smallholders with 3 ploughs. Meadow, 6 acres; woodland 1 league long and 4 furlongs wide; a half of Stoke (on Trent) Church with a half carcate of land. Value 30s. Robert De Stafford himself holds, in Westone (Weston Coyney) 1 Virgate of land. Arnulf of hesdin holds from him. Wulfric held it. Land for 3 ploughs. 5 Villagers with 2 ploughs. Woodland 1 league long and half a league wide. Value 10s. The listing of Caverswall and Weston in the Domesday Book not only proves that the settlements existed in 1086. It also provides clear evidence that they existed many years prior to the date of the survey. The Doomesday Book also records the adjacent settlements at Dilhorne, Forsbrook, Normacot, Bucknall and Cheadle. Apart from this reference in regard to Caverswall, the Staffordshire Domesday does not list either the church at Stoke or a settlement at Stoke itself. The entry for Caverswall states that Robert de Stafford had the benefit of a half share (moiety) in the church at Stoke as a part of his fee of Caverswall. In his book `The Parish Chest` Mr W.E Tate draws together the views of several historians regarding the formation of parishes. Mr Tate points to the evidence that a manorial lord would build a church for himself and his tenants, reserving to himself the right to appoint the incumbent. The lord giving his own tithe to the church and compelling his tenants to do the same. The parish taking it`s name from the location of the mother church and following the boundaries of a manor or manors.This may well have been the case at Caverswall with the original parish boundaries following those of the manors of Weston and Caverswall. Over the years the parish has been made smaller by a series of changes to the boundaries including a sub-division to create the separate parish of Werrington. In the years following the Domesday survey the tenure of Caverswall seems to have been transferred from Robert de Stafford to the hands of William Fitz Alan. A document known as the `Liber Niger` dated 1166 A.D. reveals that Walter de Caverswall was holding a fee under under William Fitz Alan. In the following year a Thomas Coyney is thought to have been the Lord of the Manor of Weston holding it under Fitz Alan. Further documentary evidence reveals that John son of Alan, (Fitz Alan Lord of Oswestry) granted the Manor of `Weston- subter- Kiversmont` to Walter Coyney subject to the chief rent of half a mark of silver. The origin of the place name Weston Coyney can be traced back to the 1400s when the Coyney family added their name to the original manorial name of Weston.